“Therefore, if anyone is in Christ, the new creation has come: The old has gone, the new is here!” (2 Corinthians 5:17 NIV). God, our Creator, is unique, not just in that He makes matter from nothing, He can also make something new where there was wear and waste. He is a creator of both innovation and restoration. He delights in restoration, in bringing life to some who have given up all hope. He also loves to bring new life to those who have lost their reason to live. He makes something from nothing when He speaks courage to the discouraged, hope to the hopeless, and cheer to the sad and lonely. His offer of an abundant life is to all who will come to Him in faith and experience the New Birth. God does not just make new things, but He takes existing molecules of matter rearranging them for some grand new design. God is not a consumer who uses and discards the wasted materials of some passing fad, growing tired of some things and creating replacements. Rather, God is the ultimate recycler. He takes the well-used, often rejected elements of nature and reenters them into the process of reclamation and redemption. One only has to observe the aftereffects of a devastating wildfire to witness the calculated reformation brought about in time. The elements in a destroyed forest decay and dissolve into revitalizing nutrients for emerging flora. The miracle of rebirth is seen in just a few years as the burnt out scar upon the landscape turns green with new and vibrant life. Restoration is built into nature and resides in the character of God. He delights in bringing new life to the soul ravaged by a life of sin. Original sin was born in the heart of rebellion from the selfish exaltation of Lucifer. In some vast past this angel of light became the prince of darkness. He was cast from the celestial realm onto the sphere of Earth, disrupting the synchronous order of creation and introducing the foreign concept of chaos. The Genesis records the chaos of the scene, “Now the earth was formless and empty, darkness was over the surface of the deep, and the Spirit of God was hovering over the waters” (Genesis 1:2). God began to speak and His creative voice and presence restored order and produced beauty. The reoccurring comment to all that He spoke was, “It was good.” His Word makes everything good. Nothing bring more pleasure to God than to see possibilities where there has been devastation. God is pleased when the wasted become renewed, the rejected are reclaimed, and the worn out and dying become rejuvenated and revived. At the close of the year we are given an opportunity to consider the moment, reflect on our progress, and evaluate our future ambitions. It’s a perfect time to establish some new spiritual goals as we consider our past progression. We have a new opportunity for a fresh start. We can wipe the slate clean and determine our future destiny in Christ. “The mystery which has been hidden from ages and from generations, but now has been revealed to His saints. To them God willed to make known what are the riches of the glory of this mystery among the Gentiles: which is Christ in you, the hope of glory” (Colossians 1:26–27). God keeps good secrets. He held on to His plan hidden from ages and from generations, but with the strategic positioning of revelation on a worldwide stage. He planned more than an obscure birthplace in a manger of Bethlehem; more than a closed club for twelve disciples or an upper room off the beaten path of limited access. He has always planned for revelation, expansion, and proclamation. So He chose a host of angels to proclaim His birth to shepherds in the field, “There is born to you this day … a Savior, who is Christ the Lord” (Luke 2:11). He chose a brilliant star to guide the Magi from distant places and angels to announce His arrival. What began in obscurity soon became the good news for all people. Through phenomenal events and miraculous signs it wasn’t long before everyone was speaking His name. The Pharisees complained, “Look how the whole world has gone after him!” (John 12:19 NIV). That was exactly His intention. His final commission was, “Go into all the world and preach the gospel to every creature” (Mark 16:15), and “Go therefore and make disciples of all the nations” (Matthew 28:19). God planned what none of His disciples could have imagined, a world population of billions with millions of followers sharing His story around the globe. 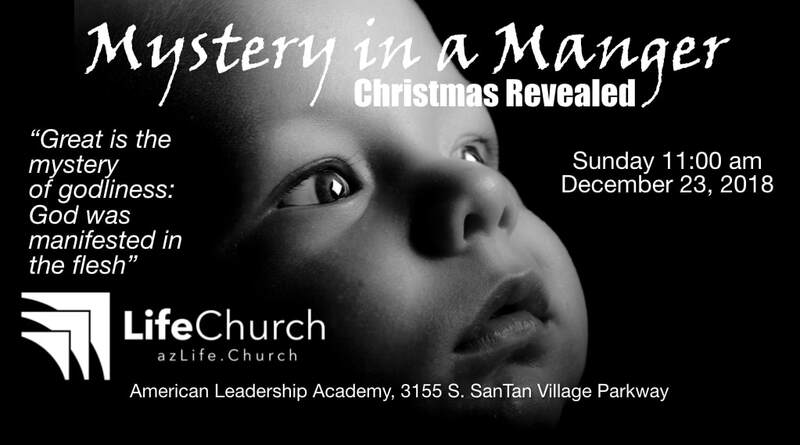 The mystery in a manger has been talked about, sang about, and shouted out from the mountain tops! The Savior of the world has come! “Great is the mystery of godliness: God was manifested in the flesh, Justified in the Spirit, Seen by angels, Preached among the Gentiles, Believed on in the world, Received up in glory” (1 Timothy 3:16). This is the mystery revealed according to His purpose, to all nations who believe in Jesus Christ. Paul said, “Now to Him who is able to establish you according to my gospel and the preaching of Jesus Christ, according to the revelation of the mystery kept secret since the world began but now made manifest, and by the prophetic Scriptures made known to all nations, according to the commandment of the everlasting God, for obedience to the faith” (Romans 16:25–26). Christ is revealed in every Spirit-filled believer. He is our hope and our glory. In Him we find revelation and fulfillment. Paul also wrote, “For in Him dwells all the fullness of the Godhead bodily; and you are complete in Him, who is the head of all principality and power” (Colossians 2:9–10). Jesus was not content just to be “God with us”; His desire was rather to be, “Christ in you!” While He came to the manger to be Emmanuel; He went to the cross to become our salvation. The angel proclaimed, “You shall call His name Jesus, for He will save His people from their sins” (Matthew 1:21). Salvation has a name. His name is Jesus. The mystery is still being revealed, day by day. The fulness of the Godhead that dwells in Him is being revealed in us! “For there is born to you this day in the city of David a Savior, who is Christ the Lord. And this will be the sign to you: You will find a Babe wrapped in swaddling cloths, lying in a manger” (Luke 2:11–12). Travel worn and weary Mary and Joseph made it to Bethlehem, the city of David, their forefather. While they were glad of their association with this family and the tribal identity of Judah, at the present it was difficult to be thankful. Due to the decree of Caesar Augustus they were forced to make the journey from the Galilee to their home land to register for the census. Pregnancy was not an excuse for exemption. So the unlikely couple joined other travelers on the ancient trails and roads to Bethlehem. The contrasts could not be more stark. In obscurity, the unknown couple made a journey of destiny. Though they had a word from an angel, an unexpected pregnancy and the scandal of carrying a child before marriage caused them to avoid too much engagement with others along the journey. Yet, there were no travelers who attracted more attention from the heavenly sphere than these unlikely youths. Prophets of ages and angelic observers waited in wrapt attention for the revealing of the Son of God. Important leaders, political pundits, and studious scholars gathered in Jerusalem. It was the capital city and anything important would surely happen there. While the religious elite complimented one another on their spiritual pursuits and pedigree, God slipped in the side door and found residence among the poor and powerless. Paul said He, “made Himself of no reputation, taking the form of a bondservant, and coming in the likeness of men” (Philippians 2:7). The humble couple could not secure lodging in the town, even with the obvious signs of pending childbearing on Mary. They were not important enough for their situation to gain attention and no one offered to make room for them to secure comfortable accommodations. Seeking the shelter of a stable, probably no more than a dark cave where farm animals were tethered, they settled in for the night. However, even without comfort or convenience, labor pains brought the birth of a child, a son, but not just any son; He was the Son of God. Paul later proclaimed that He was, “Jesus Christ our Lord, who was born of the seed of David according to the flesh, and declared to be the Son of God with power according to the Spirit of holiness” (Romans 1:3–4). Unnoticed and ignored by the population of the town, God arranged a welcoming committee among the shepherds. The hosts of angels proclaimed His arrival, “There is born to you this day … a Savior, who is Christ the Lord. … You will find a Babe wrapped in swaddling cloths, lying in a manger” (Luke 2:11–12). Swaddled in strips of cloth and nestled in the fodder of a stable Jesus was placed in a manger as shepherds came to welcome the Lord of Glory. The Word has been revealed. God became one of us, and He was God with us, made to be “a little lower than the angels” and yet He was, “Crowned … with glory and honor” (Hebrews 2:7). The great Creator became our Savior! “The mystery which has been hidden from ages and from generations, but now has been revealed” (Colossians 1:26). The mystery in the manger has been made known … He is Majesty in the manger. Christmas is revealed in Jesus Christ! a bit older. We don't read about or hear about him later in in Jesus life at 33 years of age. There's no mention of Joseph and it’s Mary that stands at the cross when Jesus being executed and and He tells John to take care of her. and then he said, “You're so highly favored that you're the chosen one to bring the Messiah into the world! The Holy Spirit will overshadow you and you're gonna have a child! Now that’s unexpected. She said she didn't know how was this could happen, but she said, “Nevertheless, let it be unto me according to your word.” She was agreeable to be the chosen handmaiden, but it it was totally unexpected. How do you explain this? Nobody's going to believe you. You know other people have claimed angelic interventions causing them to have a child, but we didn't believe them. If somebody said, “Oh, it was an angel.” “Yeah right, is that what you call him (or her)” we would respond. I call my wife an angel too! So no wonder Joseph struggled to understand this development. The older and wiser husband to be, Joseph, is trying to figure it out, “What am I going to do?” Can he trust this young girl? They were supposed to get married. The marriage celebration is a community event. Everyone shares in the joyous occasion. It is supposed to be blessed by the community and the elders. Everything was going to be great and now she's pregnant! expecting.” I think I was probably married and may have had our first child before I could even say the word pregnant in public. I was sheltered and I’m happy that I was. So, she’s expecting the unexpected. Paul Harvey used to say she's “infanticipating” (a mix of infant and anticipating). So, how do you explain that? Well, you don’t. Joseph thought about it. We have just got to keep this quiet. He considered the option to put her away. I don't know if that meant stone her or what, but but maybe he was thinking, I’ve got to get rid of this woman, or perhaps he was thinking to put her away for her own safety. The passage in Scripture said, “He thought about putting her away privately, but while he was thinking about it an unexpected thing happened. There was another appearance of an angel. truth. She's gonna bring forth a son. You shall call his name Jesus. for he will save his people from their sins” (Matthew 1:21). unexpected happen. Then there was that census idea. Whose idea was that? town and register for the census. They probably protested, “But you don't understand! My wife is infanticipating and she's getting pretty close to her due date.” They didn't care. You have got to go to Bethlehem. You're of the tribe of Judah. That’s your hometown. You have to go. So, they prepared and made the trip, an unexpected trip. They didn't really plan on making that trip. Sometimes unexpected things happen. When they got there there were more unexpected circumstances. There was no place to stay. There was no Hotwire or Priceline to compare prices and book hotels. There was no Yelp available to read the reviews. As a matter of fact, there were no hotels. All they had were some people who would let strangers come in for a night or so. It was a place to rest. A pallet on the floor. Basically shelter and perhaps something to eat. There was probably some form of payment, some gold or grain, or the exchange of some goods. They may have had a spare room, or a few rooms, just a place where people could stay. However, because everybody was coming into town, all those of the tribe of Judah, there was simply no place to stay. Everybody's house was full and there was no place to lodge. In the Scripture it's called an inn and we kind of think it is like Motel 6 or something like those fine establishments, but it not even that. It was unexpected that there would be absolutely no place to stay. Joseph must have thought, “How am I gonna take care of this woman? Now she's become my responsibility. God said take care of her, and so, what am I gonna do now? Joseph probably thought, “My Lord, help! I've never delivered a baby.” Perhaps he had assisted in the birth of a sheep or a goat in the past, but this was different. So he had an unexpected assignment. He is called on to deliver a baby! Perhaps you’ve heard of unexpected deliveries. Sometimes in a backup seat of a taxi or in a car on the roadside. I've heard stories where policemen had to help deliver a baby at the side of the road. One wasn't too long ago. It was a rookie Highway Patrol in California. He had the nurse on the phone giving him instructions while he was coaching the mother through the delivery. They successfully delivered the baby and it was born healthy. They got to the hospital and both baby and mother were fine. There was none of that, but the angel addressed the shepherds and said,”There's born to you this day in the City of David a Savior which is Christ the Lord! You're gonna find him in a stable lying in a manger.” So they went to find him in an unexpected place. didn't even bother to go to Bethlehem, just to check it out! It was a short distance away, perhaps a day’s walk, but not so far away when a king is born. The wise men sought him out and they found him — so unexpected. unexpected. You didn't really think things were going to turn out this way. Life has a way of doing that whether it's Christmas or whether it's any other time of year. It’s just life, and we often find ourselves in the place of the unexpected. However, there were some expecting what happened! Besides Mary, there were prophets who expected His arrival. Isaiah had a lot of prophecies about it. It's going to happen! A virgin will conceive and bring forth a son. This is what's going to happen. He will be the wonderful, counselor, mighty God, the everlasting father, and the Prince of Peace. Micah said it's gonna be in Bethlehem. Daniel said it's gonna be at the appointed time and all of these prophecies from from the Psalms through the prophets declared that he would come. It was like everything was all pointing to that event. The star said this is it. This is the way. He is here! Follow the star. So in all of these unexpected events it was all expected in a different dimension on a different plain and God was bringing all these things together. Every occurrence was to happen at the right time, in the fullness of time (Galatians 4:4). God brought it to pass and brought all things together. every day he went to the temple waiting to see him. Anna had a promise that she would see Him and she kept waiting and serving. She was getting old. Simeon was growing old, but they had a promise and they knew that it's about time for His arrival. In this whole world of unexpected events it was expected. All of heaven anticipated this event. It was happening. It was coming to fulfillment and here it was. The prophetic clock was just bringing it all to pass and everything was coming together at the right time and in the right place. So many people just weren't aware of these momentous events. Really just a few. When we tell the Christmas story today it feels like it was everywhere, everybody knew about it. In reality, it was just Mary and Joseph alone in the world. If it hadn't been for the angels’ announcements there wouldn't be anyone at the stable. The shepherds wouldn’t have been there. If it hadn’t been for the star and the predictions to guide the wisemen from a distant land they would not have come looking for the child. Those who were all around didn't expect him and they didn't find Him , because thy did not expect Him to appear. Here we are over 2,000 years later talking about that unexpected event. As a matter of fact even our calendars point back to His birth and His life, before Christ, and in the year of the Lord. All around the world we're celebrating Christmas, the fact of HIs birth! be so distracting and so confusing but the fact that Christmas is still being celebrated and it started out with just a handful of people that knew about it. The unexpected became the turning point of all history, the pivotal point of all eternity brought to pass right there at that seemingly insignificant moment. be your biggest blessings. That’s really tough. We don't really want to hear that. warming up food in the microwave, then turning it off and just having a good time. that's kind of the way the first Christmas was. Nothing too noteworthy about the whole thing, but we look back and talk about it now. We put the silhouette shapes and Nativity depictions in our yards and decorate our homes. We play songs and celebrate. Our child act out the ancient stories on Sunday and we go through all of this every year. We sing songs that we only sing once a year and we stumble through the words and we survive somehow because it's Christmas, and we’re still remembering the reason for the observance. It's a Christmas to remember! I pray this year will be that kind of Christmas. Not the bad stuff, but one to remember. So if you're kind of going through it tonight, just put your confidence in God. God knows the end from the beginning. He's got a time to bring everything together. He's got a way that things are all gonna work out and you might be surprised of what you learn in the most difficult moment of your life. Let those unexpected events turn out to be the big blessings that you've prayed for. Lord, I thank you that you are with us. You are Emmanuel. You are God with us! Thank you, Lord, for your birth. for your Glory. In Jesus name! “But we speak the wisdom of God in a mystery, the hidden wisdom which God ordained before the ages for our glory, which none of the rulers of this age knew; for had they known, they would not have crucified the Lord of glory” (1 Corinthians 2:7–8). Everyone loves a mystery. Maybe not the mystery itself, but the revealed secrets that clarifies the mystery. When we get into a mystery novel or movie we anticipate the unfolding drama, the twists and turns of the plot, expecting that eventually all the loose ends will be resolved and the conclusion will reveal what was clouded with uncertainty at the beginning. Perhaps there are stories that fail to reveal all at the connected developments and leave us wondering about the unanswered questions. The Bible details many mysteries, but none so important and dramatic as God’s plan of redemption and His self-revelation. A study of Scripture will reveal many mysteries as the writers supply clues and conclusions through the inspiration of the Holy Spirit. Wisdom can often be shrouded in mystery. Paul spoke of the “hidden wisdom” that was predetermined before creation. He revealed that this mystery was received by the “wisdom of God” and was manifested in Jesus Christ! This understanding was not given to the “rulers of this age … for had they known, they would not have crucified the Lord of glory” (1 Corinthians 2:7–8). Paul declared that “the mystery which has been hidden from ages and from generations, but now has been revealed to His saints. To them God willed to make known what are the riches of the glory of this mystery among the Gentiles: which is Christ in you, the hope of glory” (Colossians 1:26–27). Jesus was the revealed wisdom of God. Paul said, “He is the image of the invisible God, the firstborn over all creation. For by Him all things were created that are in heaven and that are on earth, visible and invisible, whether thrones or dominions or principalities or powers. All things were created through Him and for Him” (Colossians 1:15–16). In Paul’s first letter to Timothy he established that the mystery of godliness was revealed in Christ. He wrote, “God was manifested in the flesh, Justified in the Spirit, Seen by angels, Preached among the Gentiles, Believed on in the world, Received up in glory” (1 Timothy 3:16). The mystery in the manger signaled the pivotal point of all time. The hidden wisdom was seeking revelation. The fullness of time had arrived. God stepped into His creation as a baby born in Bethlehem. Throughout His life and ministry the plot of salvation was developed and the mystery of ages was revealed in redemption. This was the plot. This was His plan. This was the truth He had come to reveal. As Jesus told Pilate as He was being judged, “For this cause I was born, and for this cause I have come into the world, that I should bear witness to the truth” (John 18:37). Paul’s passion was to make known the mystery by revealing God’s wisdom. He said,“My goal is that they may be encouraged in heart and united in love, so that they may have the full riches of complete understanding, in order that they may know the mystery of God, namely, Christ, in whom are hidden all the treasures of wisdom and knowledge” (Colossians 2:2–3 NIV). The mystery is revealed. From the manger to the ascension, from His birth to His resurrection, from the promise of a Savior to the provision of His Spirit, the mystery of ages was given form and substance. Wisdom was revealed and the shroud of secrecy melted into the clarity of fulfillment through the coming of Messiah, Jesus Christ. “But when the fullness of the time had come, God sent forth His Son, born of a woman, born under the law, to redeem those who were under the law, that we might receive the adoption as sons” (Galatians 4:4–5). Waiting can be one of life’s most difficult experiences. Especially when expecting something that has been promised. In an age of instant gratification, and entertainment on-demand we often skip the lines and find an alternative to satisfy our desires. However, there are some important things in life that can only be enjoyed by waiting. Some things just take time! It is like waiting on a sunset. Sometimes it seems like the sun hangs in the western skies without moving at all. Then as the ball of fire kisses the horizon it suddenly seems to speed up, sinking into the shadows and casting its final rays of glory into the skies of gathering dusk. After long hours of sunlight the day fades into night and another day is done. Waiting can be like that. Events that seem to be so far away suddenly begin to happen and the completion of the promise comes quickly. Time that once seemed like an enemy becomes our friend ushering in the days of fulfillment. As a child I remember feeling that the days between Thanksgiving and Christmas crawled at a snail’s pace and it was an eternity before the last day of school, preparing for dinners or road trips to visit family, and finally the arrival of Christmas Day … and then it was over! The thought of another entire year, 365 more days, until Christmas was almost more than I could imagine. There have been many promises made that were linked to the clock and calendar. Some events were predicted but the exact timeframe was not revealed. Fulfillment was always out there somewhere but the time of completion was unknown. So it was with the multitude of prophecies concerning the coming Messiah. Prophets through the centuries had insight and share glimpses of things to come. From the first prediction God gave to the serpent of temptation concerning the seed of the woman, “He shall bruise your head, And you shall bruise His heel,” until the prophet Isaiah revealed that Messiah would be “wounded for our transgressions,” and “bruised for our iniquities” (Genesis 3:15, Isaiah 53:5). Details of His arrival were prophesied and His purpose was revealed. The location was determined, “Bethlehem, … out of you shall come forth to Me the One to be Ruler in Israel” (Micah 5:2). He would come to save, Isaiah predicted, “And it will be said in that day: ‘Behold, this is our God; We have waited for Him, and He will save us. This is the Lord; We have waited for Him; We will be glad and rejoice in His salvation’” (Isaiah 25:9). So it was no wonder that the angel spoke these instructions to Joseph, “She will bring forth a Son, and you shall call His name Jesus, for He will save His people from their sins” (Matthew 1:21). Prophets and scribes collected and recorded the predictions and events that led up to the arrival of the Promised One. For centuries they were just hopes and dreams … and the waiting! To those who lived and died in faith there was no question that it would come, but there was no knowledge of when it would be fulfilled and how it would all be accomplished. When the prophetic clock reached the appointed time the bright star pointed the way for the wisemen to a birthplace, shepherds were led to a stable, and the census decree drove the young couple to the town of their lineage. Every event supplied the fulfillment to a relevant prophetic passage. Paul wrote that it was at the fullness of time, the plan was enacted and revelation wrote the story of redemption. Messiah has come. The mystery of the ages would visit the manger of Bethlehem’s stable. Christ has come! We may also find ourselves often waiting on the fulfillment of promises: the saving of a spouse, the restoration of a wayward child, the anxious needs in our personal lives. We also live in hope. The fulfillment of time will also bring us the revelation He has promised. Paul said, “But if we hope for what we do not see, we eagerly wait for it with perseverance” (Romans 8:25). Keep believing! “The Lord has chosen you to build a house for the sanctuary; be strong, and do it” (1 Chronicles 28:10). This year began with a vision to “Arise and Build” a new worship center for our congregation. Many steps have been taken to bring us to this day. We have interviewed construction companies, civil engineers, and architects; and researched different ways to finance this project. We have sketched ideas for the site plan, inquired for details in codes and zoning, and looked at various other church blueprints and buildings. Each step of the way we have prayed for direction, sought advice from those who have specialized experience, and dreamed of the ultimate outcome and finished product. Today marks a milestone. This is a major event in our progress. Today we place a symbolic shovel in the soil of this property where we will construct a place of worship. We will dedicate this site for the glory of God, that we may establish a landmark for a spiritual lighthouse, and build a gathering place for all those who desire a relationship with the living God. In our cities there are many houses of worship, places for community gatherings, and assembly halls for celebrations and social events, but this will be a place where lives can be transformed, where we will witness miracles of healing and see the powerful truth of the New Birth experienced. We are more than a church. This is a mission and a movement. We build with an eternal purpose to propel our passion, and we construct with the conviction that God has commissioned us to share the good news with our generation. We believe that it is our responsibility to proclaim to the world the truth of one eternal God, revealed in the flesh of Jesus Christ; that His name is the only door of salvation; and that His Spirit provides access into a whole new world of liberty, of identity, and deliverance. Jesus is “the way and the truth and the life” (John 14:6). His Name is “above every name, that at the name of Jesus every knee should bow” (Philippians 9:9–10), and there is no hope of “salvation in any other, for there is no other name under heaven given among men by which we must be saved” (Acts 4:12). The Gospel of Jesus Christ is embodied in this passage of Peter’s Pentecostal sermon, “Repent, and let every one of you be baptized in the name of Jesus Christ for the remission of sins; and you shall receive the gift of the Holy Spirit” (Acts 2:38). On this site, in this place, there will always be a witness of truth and the everlasting Gospel shall be proclaimed. In the early 1950s, my grandfather moved onto a dairy farm not far from here in Higley. An itinerate preacher, he and his wife and their two younger children transitioned here from Arkansas and they based here while preaching around the state. Years later, in Wichita, Kansas, Mark Baughman baptized a young man, Leroy Hampton, who eventually became a preacher and felt the call of God to start a church in this metro area. 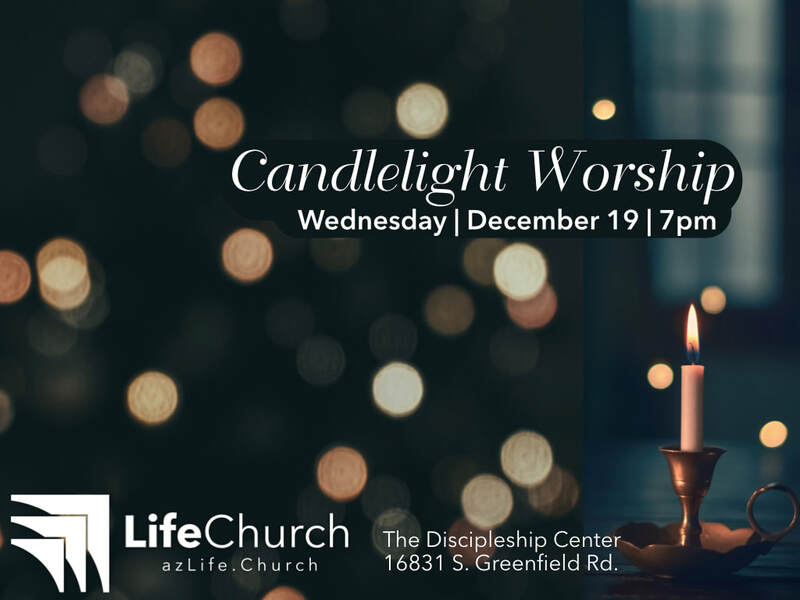 The Hamptons friendship with the Robert & Elaine Bibb led them to launch the beginning of this congregation in the East Valley. After his untimely death Bibbs became the pastor of Abundant Life Church in Gilbert and relocated the church to what was then a rural area along Greenfield Rd, halfway to Queen Creek. After eight years we assumed this pastorate and have been blessed with growth, a vision to expand, and opportunities to acquire the needed property. ​Today we stand on 2 1/4 acres of property in the crossroads of the Southeast valley and are launching a project that will be more than a structure … it will be a launchpad for ministry throughout the region. The effects of this construction will be felt around the world as we continue to fulfill the mission God has placed in our soul. God has prepared the soil and its growth will result in a spiritual harvest. Today is also a day of Thanksgiving. Thanks to all who have gone before, sacrificed, prayed, and paid for every step of faith. Today, we are debt free, except for the eternal debt of gratitude to a host of believers, to preachers and teachers, and most of all to our Lord Jesus Christ who has made this possible. Today marks … a new beginning, for LifeChurch International and for every individual who will find him in this place! “In everything give thanks; for this is the will of God in Christ Jesus for you” (1 Thessalonians 5:18).